The text adventure is a genre which has lost its popularity as technology has advanced, but for those with an active imagination, it is one that is filled with possibilities. Infocom's games of the 80s like the Zork series or The Lurking Horror stand up as classic examples, and while Asylum may not be quite up these standards, for the curious or for adventure afficionados, it makes for an entertaining romp. Let's make things clear from the start: there are no graphics here, merely text, so if you need flashy visuals, this is not a game for you. Instead, the game relies purely on its prose storytelling skills, which while somewhat dated in style and lacking in obvious creativity, don't actually do a bad job. 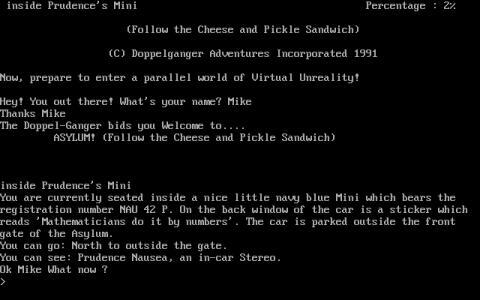 The rather bizarre plot is difficult to describe, but features an in-car stereo named 'Prudence Nausea' which gives you some idea of what to expect as does the game's subtitle: Follow the Cheese and Pickle Sandwich. Basically, you get caught up in a quest to rescue the mysterious Doppelganger from the titular asylum, and which is achieved by reading short descriptive passages then using text-based commands to explore, solve puzzles and interact with other characters. Such adventures live and die by their interface, which must be intuitive enough to allow for easy exploration but complex enough to provide enough challenge. Asylum's falls somewhere in the middle, and is slightly difficult to pick up, especially for newcomers to the genre, but it is worth persevering, as for those of the right frame of mind, this is an entertaining and worthwhile excursion into the joys of text-based adventures.